The BBS is running on a real Apple IIe with a Doudisk. The Software is GBBS Pro V1.2. The goal is to have a BBS in the style of the 80's. Thanks a lot to Skipper1947 and CWJ_Wiko for their help! Cool! Just saw your post. I will check it out today. Thanks for Logon and your Bulletin! Added the first VisiCalc sheet from the book "Doing Business With VisiCalc" in the download section of the BBS. I started six days ago and will keep moving on to modify and add things - makes a lot of fun! You are welcome to make an account at A 80's Apple II BBS. Congrats to this very good article about Dura-Europos BBS! Added a VisiCalc sheet to downloads. With that you can compare the value and the forecast of a house or an apartment you want to buy to other objects. Explanation of the sheet and how to use it you will find in Bulletin #40. Added a Timemaster II H.O. to the BBS - now it is running with real time. Is the BBS still running? I have been trying to connect now for about a week and have not been able to. Tried with Syncterm and my Apple IIc Plus and a Wifi232 modem. But please excuse the discomfort! I had problems with a client that should start tcpser when it stopped working. The client starts tcpser but sometimes with a long delay. At the moment I'm on vacation - will be back at the beginning of the next week. From here I check the BBS with my IPhone and I saw that tcpser was down and then started again. Excuse the trouble - all this makes me very uncomfortable - A 80's Apple II will run without breaks next week again perfectly all right! Cool thanx for the reply - I look forward to logging on with my Apple IIc. I'm back from holiday - solved the problem. The BBS is running perfectly all right. Visicorp_Apple_II_disk_utilities_for_internal_use_only - wrote Bulletin #116 about on A 80's Apple II BBS. A 80's Apple II BBS is now running for two month's. In that time we got more than 550 calls and our member's wrote more than 130 bulletins! Thank you for making such a great Apple II BBS! Therefore the BBS is running on a real Apple II with real 5.25 disks we had to archive the first decade of bulletins. Top Topics on the bulletin board can always be found in system news - just press "$" from the main menu. Host a BBS with WiFi232? 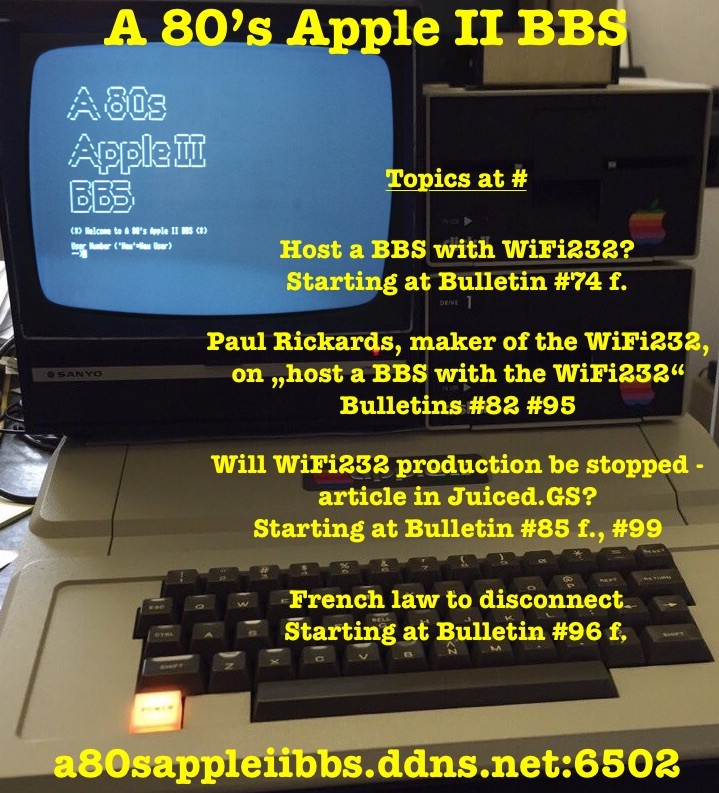 Starting at Bulletin #15 f.
Will WiFi232 production be stopped - article in Juiced.GS? Starting at Bulletin #37 f.
Starting at Bulletin #58 f.
That's a nice DuoDisk stack there. I was running my old board (in 2014) with 2xDisk IIs and a DuoDisk. Next step, a hard drive maybe? Next step, a hard drive maybe? Nah, it's gotta be a 3rd DuoDisk. Btw I am reading Hartmut Esslinger's Keep it Simple, his book on frogdesign's work for Apple in the 80s. If anyone now reading this Apple II forum hasn't seen/read this book-- do it! It provides a really fascinating look into Apple of the early 80s and why the Apple IIc and Apple IIgs look the way they do compared to the earlier Apple models and the early Macintosh. Oh well, I'm searching for a nice hard drive! If someone wants to sell one please let me know (I search for an Apple ProFile or similar)! But I don't want to run the BBS from a hard drive. This special old school style with the real disks is great. That's how the most boards were running in the 80's. So I think I'll not change that. Of course I have to archive often the Bulletin Board, but that's ok.
No, a third DuoDisk is not possible because GBBS Pro V1.2 can't handle that ... but that would be cool! The War Games Game begins! Loose money - make an investment? The Uthernet II Beta Test for the next run has begun! We take part in that test! I went to the BBS site. FYI, I could only get the "A 80s Apple II" screen from the top tab, not from a second tab I had opened in my browser. I was not able to do anything but see the page. Well, you have to use a telnet connection to reach the BBS. a80sappleiibbs.ddns.net:6502 is the telnet address! 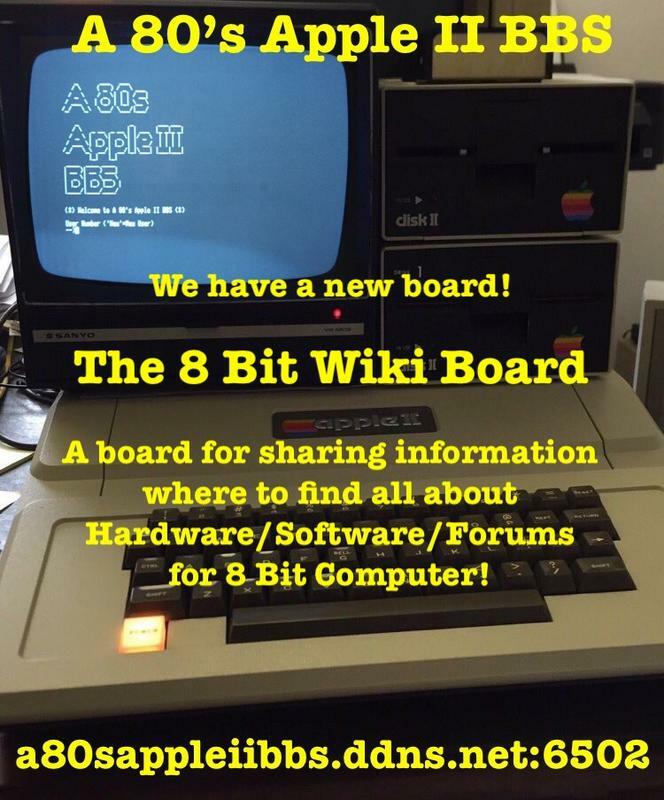 We have a new board - "8 Bit Wiki Board"
All about on A 80‘s Apple II BBS! It's summertime! Planing a trip? Car, Motor Home, Flight, Hotel, Gas, Tax ...? What are the costs? Plan your trip with the Trip Cost Accountant - free download on A 80's Apple II BBS! 1 Year On The Air - 421 Members! Thank you for making such a great BBS!!! The Uthernet II Beta Test is moving forward! We have now an ASCII Art gallery! Just type "G" from main menu. 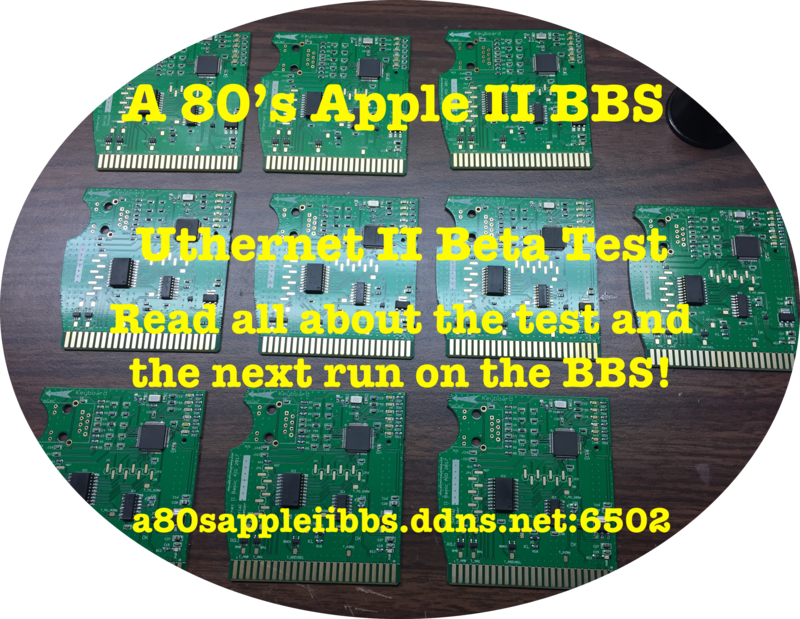 I started to learn cross compiling C to modifiy programs for the Apple II and the Uthernet card! Thanks a lot to Oliver Schmidt for his great help! On A 80's Apple II BBS I describe in detail the steps I go - have a look at the 8-bit-wiki board! That's pretty cool stuff! I bet a lot of people will be surprised that a //e can do a lot of those things. I've also been working with cc65 and ca65 recently. I'm working on the software to do in-circuit programming of the EEPROM on David Mutimer's Quickloader Reboot card and I'm using ca65 to cross assemble the code from my Linux laptop. Right now I'm working on the low level code to actually delect the right sector and bank on the card which I'm doing in 6502 assembler, but I will probably do the UI in C because that will be a whole lot quicker to develop. Back in the old days I used to do the C with Aztec C65, and before that I would have written the assembler with various assemblers, DOS Toolkit, LISA 2.5 or ORCA/M, I used all of those at various times. Before I got Aztec C65 I would usally write the time critical parts in assembler and call that from Applesoft. Yeah! I was also very surprised. 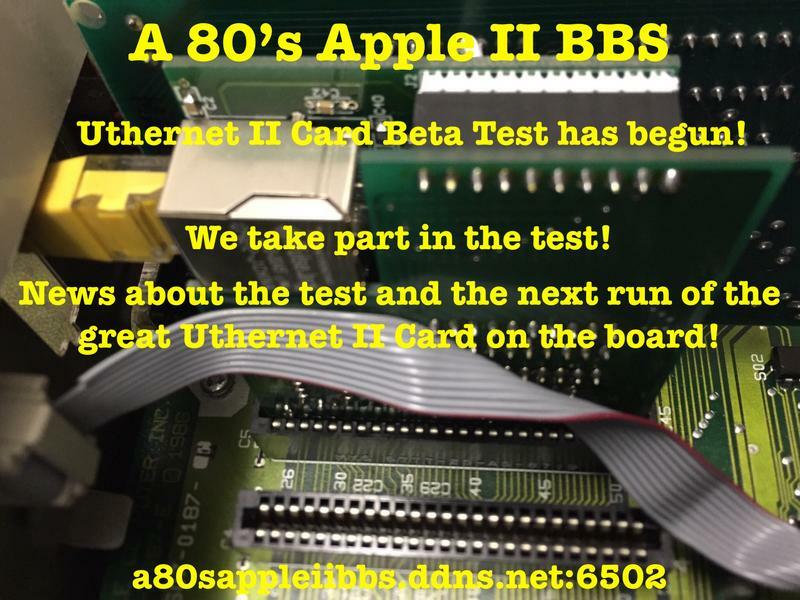 It is so great that the Apple II can do all this just with the Uthernet card. I don't like these solutions when a PI f.e. is connected and the Apple II is working just as a keyboard for the PI - that's not Apple II. But this way is awesome as the Apple II is doing all on it's own! Oh well, what you say about your experience with C is huge! I just started to go the first steps, but I'm impressed how fast you are able to modify programs for the Apple II. They don't need much space and work very fast. Really great! Yes, C is basically "structured PDP assembler". It is pretty close to the metal so as far as "high level" languages go it is generally fairly efficient. But it offers enough power to do a lot of things fairly easily. The real power is in the libraries though. There are C libraries for just about everything because it is the base of virtually all modern computing. Most other languages in common use today either developed out of the C family directly or were originally (and in many cases still) developed with C. Dennis Ritchie was one of the truly most influential software engineers and also one of the most underappreciated. Anyway, being able to bring a lot of C code over to the Apple II will enable some things to happen that probably a lot of people never thought were possible. I've been thinking of doing a port of either 2.x BSD or maybe XINU to //e hardware (with some upgrades). I think it will be possible. It is down the road a ways though, I've got a lot of other projects to work on first. The ability to do cross compiling with cc65/ca65 will make a lot of things faster. Eventually I would hope that BSD or XINU would be "self hosting" and able to build themselves nativelly with a C compiler, but it may still be faster to do the cross compiling than to do it natively even once that would be possible. I've done the final build of IFTTT65 and uploaded it to asimov including the source code. IFTTT65 contains all above mentioned programs! SPAM post above. Do NOT click on the link! Here is the new version of IFTTT65 including Slack!